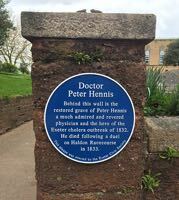 In the front of the burial yard of St Sidwells Church, just opposite the Monkey Suit can be found a restored tombstone to an Irish physician, Dr Peter Hennis. 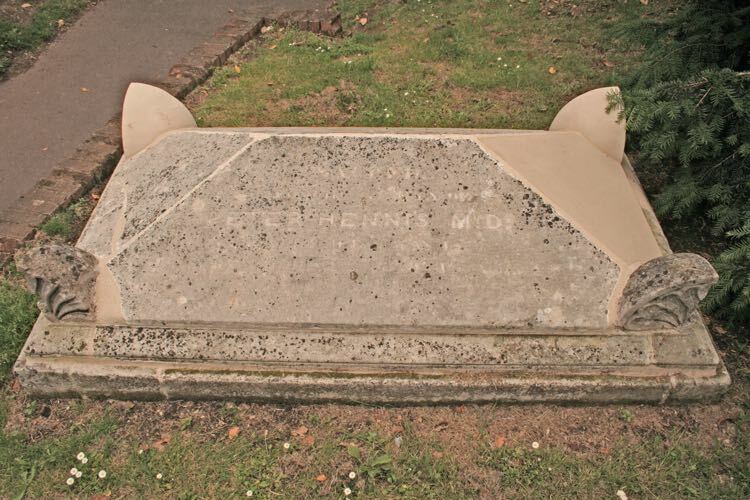 This is the final resting place of a hero of the Exeter cholera epidemic, and the victim of Devon's last duel. 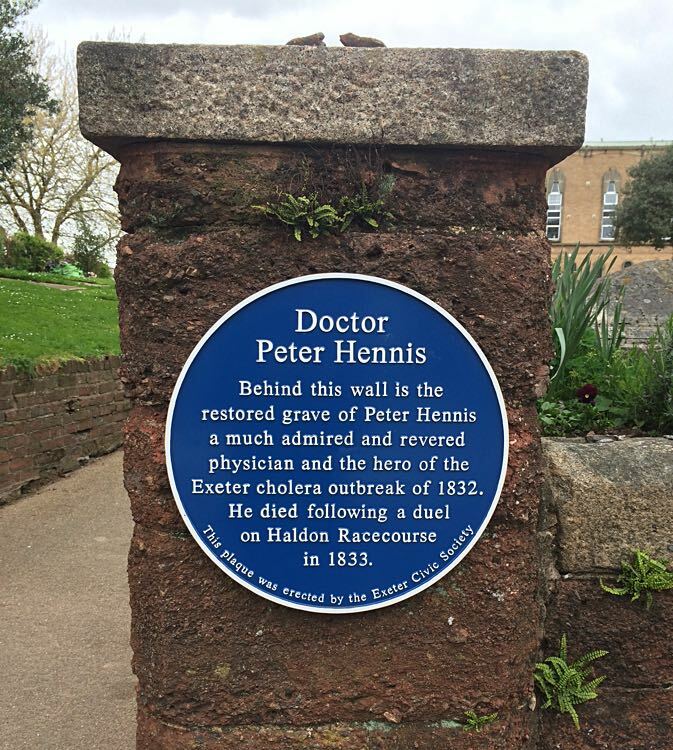 Hennis was an Irishman who had gained a high reputation in Exeter for his work with the poor during the cholera outbreak of 1832. It was the next year, that Hennis, through a series of circumstances, found himself preparing for a duel. Sir John Jeffcott, a High Court Judge often visited Exeter as part of his duties. He had met and fallen in love with the grand-daughter of Flora Macdonald, the famous Scottish rebel. The girl lived in High Summerlands with her family at the time. Unfortunately for Jeffcott, the relationship did not prosper, after he was informed by a friend that Dr Hennis had allegedly been spreading rumours about Jeffcott and the Macdonald family. However, a journal written at the time by Jeffcott suggests that he was an uncouth drunk, who delighted in humiliating the poor. This extract from Jeffcott's journal confirms his attitude. April 15, 1832 - Cold. It has been reported to me that Dr Hennis told the hunting parson's daughter that I was an amoral coxcomb, a vapid man terrified of the gutter and the poorhouse. I barely know Hennis, but I will not forget this slur. Eventually, after an argument in the street, and after Jeffcott had been informed of gossip about him, that Dr Hennis had allegedly spread, while he was drunk in the Royal Clarence Hotel, the two found themselves committed to fighting a duel. The pair found themselves at Haldon Racecourse, taking one of a pair of pistols each, and pacing out the distance. "In our notice of this melancholy affair, we were unable to bring the parties engaged in it, up to 2 o'clock on the afternoon of Friday, 10th of May. At half-past 3, Sir John Jeffcott and Mr. Charles Milford entered a post-chaise at the Clarence Hotel, and drove hence to Mr. Fridham's, painter and glazier, Magdalene-street, the lodgings of Mr. Robert Holland, where they took that gentleman up. They then drove to the top of Haldon opposite the Race Stand, between 6 and 7 miles from Exeter, on the Chudleigh road. Here all the gentlemen left the carriage, and walked in towards the race course. At about the time already stated, Dr Hennis and Captain Halsted entered a post-chaise of Mr. Clench's which was awaiting their arrival, on Exe Bridge, and also proceeded towards Haldon, on the Chudleigh road. Nearly opposite the 6 mile stone, they alighted and quitting the road by their left, walked in over the Down. The parties met on a part of the New Race Course, and took their ground at fourteen paces distance. The fatal result is known. Dr. Hennis immediately upon his being wounded, expressed his opinion that the ball had passed through his stomach. There was not much discharge of blood outward, and being placed in a post-chaise, the driver proceeded at a rapidpace towards Exeter, the journey not exceeding half an hour. On his way home, Dr, Hennis, after placing his hand under his left breast, expressed to his friend Mr. Edye, who was with him, his opinion that the ball had lodged in the pericardium, or very near it. Mr. Edye assigned his reason for thinking differently, and added that he would not attempt to deceive him. Dr Hennis replied, not at a time like this. I am sure you would not. He also said, It is very hard that a man should be obliged to be placed in such a situation, being accused not only of what he was never guilty, but what he had done all in his power to prevent :- that he had never said or done what he was charged with, but had acted quite in a contrary way. He added, I am sorry for poor Halsted - If it should prove fatal I fear he will get into a scrape in consequence of serving me. He also stated that he had not intended to fire, having always made up his mind, if he was obliged to go out on an affair of that kind, that he never would fire at his opponent." Dr Hennis died in agony a week later. The post mortem reported that the ball weighed half an ounce (14 grams), had entered his body below the shoulder blade, shattered a rib, and was lodged in the left, lower diaphragm. He would undoubtedly have been saved with modern treatment. His funeral was attended by 200 to 300 mourners while 20,000 Exonians lined the route from his lodgings in the High Street to St Sidwell's Church for the service. The funeral was widely reported with this piece appearing in the Roscommon & Leitrim Gazette. FUNERAL OF DR. HENNIS Exeter, May. 23.—The funeral of Doctor Hennis took place to day. The shops in High-street were closed till after the procession passed, and the lower parts of the city the windows were partially closed throughout the day. The body was borne to the grave by several gentlemen, personal friends of the deceased. These were followed by about two hundred gentlemen in mourning and crape. Several thousands of the inhabitants constituted the remaining portion of the melancholy procession.— The body was deposited in St. Sidwcll’s church yard, and an anthem was sung over it before the tomb was finally closed on it ever. Thomas Shapter, who would become well known for his book about the cholera outbreak the year before, and had worked with Hennis during the outbreak, was one who carried his coffin. Jeffcott fled to Sierra Leone, only to return a year later when he was acquitted of murder due to lack of evidence. He took up an appointment in Australia where, four years later, he was drowned while being transferred to a prison ship as part of his duties. Dr Hennis' grave became neglected over the years and parts broken off, but it has now been restored at a cost of £4,000. Sources - from articles by Paddy Broughton in the www.flyingpost.co.uk and Trewman's Exeter Flying Post of 23 and 29 May 1833, and the Roscommon & Leitrim Gazette. The restored grave of Dr Hennis in St sidwell's Church yard. The plaque to Dr Hennis at the entrance to the churchyard.